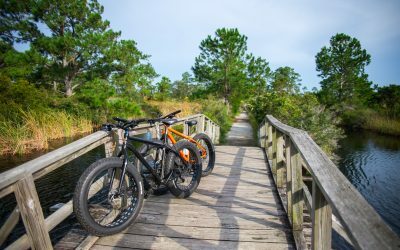 The tour can be as long as 12 miles of meandering single-track with gentle climbs and descents through a long-leaf pine forest. The tour begins at the Red Rock Bridge trailhead which is along beautiful Juniper Creek. Juniper creek is a favorite among kayakers. It flows steadily with crystal clear water and large white sandbars around every turn. It makes for an excellent place to begin and end a ride. 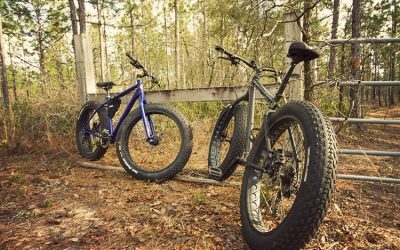 You will be riding on well-maintained fatbikes with 27-speed drive-trains, 4 inch tires, and hydraulic brakes. Helmets, gloves and hydration packs will be provided. In the warmer months, the tour departs as early as you can do, as the heat gets intense quickly in the Florida sun. This is a off-road, narrow trail ride and you should have basic off-road riding skills, and you should be in moderately good shape because you will get a workout. There are gradual inclines and when combined with Florida heat can take a toll on your legs. We take no more than 3 guests per tour and no one under the age of eighteen (ID is required by our insurance). The tour will take about 2-3 hours to complete, but could take longer depending on how many stops and of course, the length of trip. 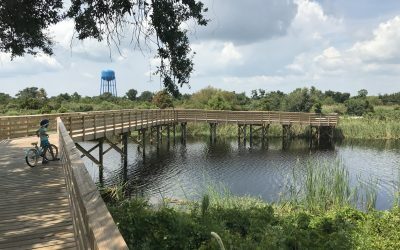 At the end of the ride you can hang out on a secluded white sand bar along beautiful Juniper Creek and have a snack or take a dip in the water to cool off, or both! If you would like to book a tour please fill out the form below and we will respond back within a few hours. Thanks for choosing Hamilton Mountain Bike Tours as part of your vacation.